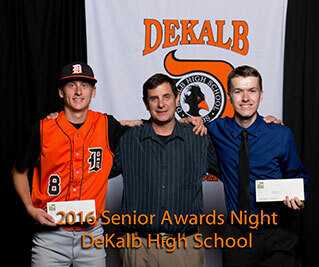 Scholarship funds at the DeKalb County Community Foundation are a great way to honor and memorialize loved ones while investing in our community's future generations. Scholarships are listed below, along with current recipients as the information becomes available. For questions or additional information on scholarships administered by the DeKalb County Community Foundation, please contact Becky Zantout, Grants & Community Initiatives Manager, at (815) 748-5383 or becky@dekalbccf.org. The Palmer Family Music Education Fund was set up in 2009 and is awarded each year to a DeKalb County high school graduate wishing to pursue a career in music education. The 2016 recipient, Zoe Markle, plans on continuing her education at Lawrence University where she will study Instrumental Music Education. Zoe has participated in the orchestra program at DeKalb High School for the past 4 years. 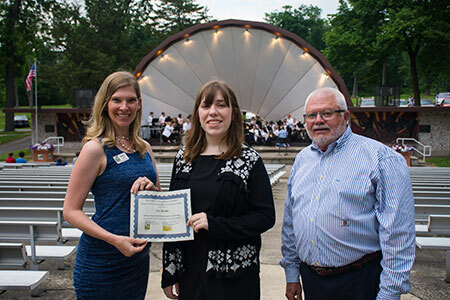 She is an Illinois All-State Musician and has successfully auditioned and been selected for a a variety of performances, including the 2016 Illinois Ambassadors of Music Orchestra European Tour. Learn more. Applications for the Palmer Family Music Education Scholarship will be available again in the spring of 2017. Awarded each year to a DeKalb County resident, the Renaissance Scholarship is given to an individual who has been in the workforce and is returning to school for his or her undergraduate degree. The 2016 recipient, Anousone Bouttaphanh, plans on pursuing a degree in Office Systems at Kishwaukee College. She is known by her instructors as a committed learner who puts in the time, energy, and resources to learn as much as she can from her classes. Applications for the Renaissance Scholarship will be available again in the spring of 2017. 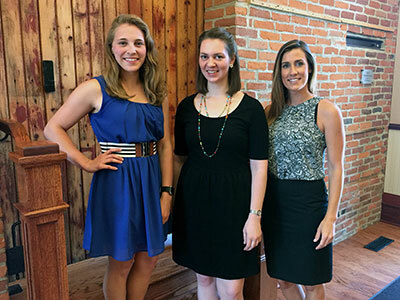 2016 Spinoso Scholarship recipients (left to right): Lydia Moore, Veronica Behrens, and Morgan Latimer. Not pictured: Blair Wright and Shelby Wood. The Spinoso Masters Scholarship provides scholarships to deserving students to cover tuition costs of post-undergraduate or masters studies. 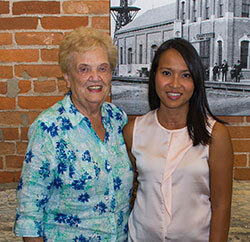 This year, a total of $30,000 was awarded among five recipients. Applications for the Spinoso Masters Scholarship will be available again in the spring of 2017. Eligible applicants to the Harold P. Wells Scholarship are employees of the DeKalb Fire Department and their families, and students in the Fire Science Program at the Kishwaukee Education Consortium. The 2016 recipients are Connor Hoyle and Joshua Gilmore. Connor plans on attending either Eastern Kentucky University or Western Illinois University to study Fire Administration and/or Fire Protection Services. Joshua plans to attend Iowa State University where he will study Aerospace Engineering. Learn more. Applications for the Harold P. Wells Scholarship will be available again in the spring of 2017.